WTF Are You Reading? 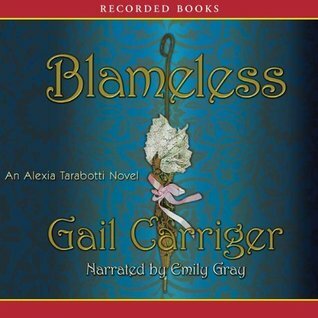 : There's Nothing Boring About "Blameless"
There's Nothing Boring About "Blameless"
This third book in the series was so good that I just stayed in bed all day and listened to it. I must say that Alexia is one of my favorite characters EVER! This series never ceases to delight, amaze, enthrall and entertain. ....and that's just in the first few chapters. The thing that keeps me coming back for more is Alexia's indomitable spirit. You just can't keep a good "soul sucker" down. Especially when she has her friends, her sense of humor and her James Bondesque Parasol. The adventure, storyline, setting and characters are so well-written that you just want to stay in the story forever. Emily Grey is the best narrator EVER! Her voices are so well done that you don't bat an eye at the fact that most of the characters that she is voicing are men. If you like steampunk, romance, vamps, wares, and killer UMBRELLAS...you will LOVE this BOOK! "I mean to say, really, I am near to developing a neurosis - is there anyone around who doesn't want to study or kill me?" Floote raised a tentative hand. "Ah, yes, thank you, Floote." "There is also Mrs Tunstell, madam," he offered hopefully, is if Ivy were some kind of consolation prize. "I notice you don't mention my fair-weather husband." "I suspect, at this moment, madam, he probably wants to kill you." Thanks so much for stopping by. I love comments, so please leave a few. WTF Are You Reading? has read 0 books toward her goal of 200 books. Share book reviews and ratings with WTF Are You Reading?, and even join a book club on Goodreads. Simple theme. Theme images by jusant. Powered by Blogger.